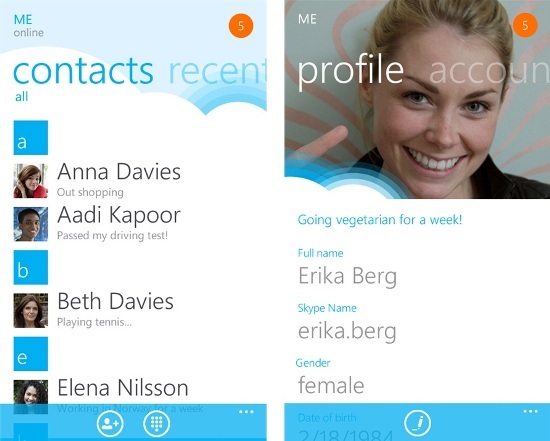 If you remember, Skype was taken over by Microsoft and we speculated that we might see the popular voice over internet app heading to the Windows Phone platform. Indeed we did see it launching, but it was a beta version. But today we see that the app has left the beta stage and has been updated to version 1.0. The new version is more stable and now has the ability to search and add new contacts, as well as call landline numbers from the app over Wi-Fi and 3G. The app however STILL doesn’t run in the background, so if you exit the app, you are disconnected from Skype. We presume this is because if the app is active in the background it drains out a lot of battery. The app now supports 18 languages including English, Danish, Dutch, Finnish, French, German, Italian, Japanese, Korean, Norwegian, Polish, European Portuguese, Brazilian Portuguese, Russian, Simplified Chinese, Spanish, Swedish, and Traditional Chinese. Check out the new update at the Windows Phone Marketplace over here.